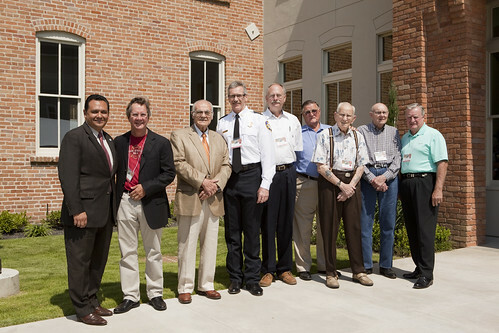 From left: Mayor Pro-Tem and District H (Sixth Ward) Council Member Ed Gonzalez; Axiom President Tom Hair; retired HFD chief Joseph Perino; current Fire Chief Terry A. Garrison; and retired chiefs Phil Boriskie, V.E. Rogers, C.R. Cook, Raymond R. Harrison and Lester Tyra. While the pursuit of historical facts about Fire Station No. 6 is an ongoing endeavor, the station is also the place where history continues to be made since Axiom fully moved into the 1702 Washington site on Feb. 25. The station, which opened in 1903 and housed Houston firefighters during its first 28 years of existence, embraced the “Rough and Ready” reputation that developed from the volunteer days of Mechanic No. 6 that was organized in 1873. Fast-forwarding to the 21st century, the “Rough and Ready” spirit was not lost on Axiom during its efforts to get the word out after a successful restoration of Fire Station No. 6. In April and May, The response was robust, from passers-by to local media outlets KUHF-FM 88.7 (Houston Public Radio), Houston Chronicle, CultureMap, Houston Press. The story of Fire Station No. 6 spread to the website Fire Engineering, a national trade publication for emergency services personnel since the late 1800s. Firefighters from other stations in Houston visited Fire Station No. 6 to get a look at the renovated interior, including the enlarged black-and-white photographs on the walls, the concrete ground floor and the pinewood second floor, the fire poles in their original positions, the original wood pillars, the view of downtown and more. Tom Hair with the “C” shift of the current Station No. 6, located at 3402 Washington Ave., about a half-mile west of the historic Fire Station No. 6 building. Fire Station No. 6 became the site of even more history in the making. On May 22, a commemoration ceremony was held in honor of the lineage of living chiefs of the Houston Fire Department. Retired HFD chiefs C.R. Cook, Joseph Perino, V.E. Rogers, Raymond R. Harrison, Lester Tyra and Phil Boriskie were in attendance. (Two other former chiefs, Eddie Corral and Chris Connealy, were unable to attend.) Current Fire Chief Terry Garrison and Executive Assistant Chief Richard Mann, along with City Council Member Ed Gonzalez, were also at the ceremony. Not least, the “C” shift of the current Station No. 6 firefighters, led by District Chief Wallace Page, the Axiom staff and others were on hand for the ceremony. 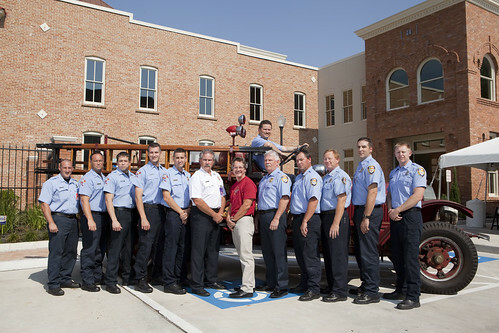 Axiom President Tom Hair observed how the restored Fire Station No. 6 might appear to Houstonians in 2112 relative to the way we look at it now, more than 100 years after its opening in 1903. Gonzalez, himself a former Houston police officer, expressed pride in the building’s significance to the Sixth Ward community that he represents. Jay Evans, a former HFD spokesman, introduced the lineage of chiefs to the crowd. The occasion was full of photo ops and reminiscing among the retired chiefs over firefighting days past. They took a tour led by Hair and Evans, who was instrumental in assembling the chiefs together, something that had not been done previously. Chief Garrison said that he met his predecessors for the first time here at the Fire Station No. 6 ceremony. KTRK-TV Channel 13 covered the event for its “Hometown Live” segment. Shortly after “Hometown Live” aired during its 4 p.m. telecast, a couple from Australia parked their RV in the parking lot and paid a visit. Turns out the man was a firefighter based in Sydney. Both purchased T shirts as souvenirs. Since the May 22 event, Axiom continues to field requests for interviews and the occasional tour group, but most of all, it’s back to the business of creative communications. As for “Rough and Ready” … the spirit is alive and well at Fire Station No. 6, and Axiom is in the middle of it. View the complete photo set on Flickr.